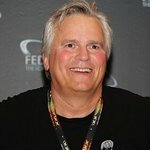 Fans of MacGyver and Stargate were out in force in Long Beach last month to witness Richard Dean Anderson make a special appearance at the 2nd Annual Quench the Fire 5K Run & Walk at the El Dorado Regional Park. It was the second time the 58-year-old star has been part of the event – he emceed the 1st annual event in 2007. This year he made a return appearance, signaling the start of the race and announcing the winners as the race concluded. He also signed autographs and posed for pictures. Proceeds from the event benefited the USC Pain Center at the Keck School of Medicine at USC in its goal to raise awareness of neuropathic and other chronic pain conditions such as Reflex Sympathetic Dystrophy. Anderson’s own doctor is associated with the facility, and funds will be used for clinical research and trials, patient education, and community outreach events.